How do we tackle the three major policy challenges facing Nigeria’s primary school teachers today? “We also will partner with State and Local Governments to recruit, train and deploy 500,000 unemployed graduates and NCE holders. These graduate teachers will be deployed to primary schools, thereby, enhancing the provision of basic education especially in our rural areas”. Will this initiative provide a meaningful change to Nigeria’s primary education? One of the biggest limitations to improving the quality of primary education is having a low-skilled teaching profession. Students learn more when they are taught by higher quality teachers. Indeed, it seems that the impact of other investments to improve education (e.g. in textbooks or school management training) also depend on the quality of teachers. However, it’s one thing to know that teacher quality is important and another to know how to improve it. To support the process of improving teaching effectiveness, EDOREN has carried out several studies focusing on teachers in the last two years. These are now brought together in a new synthesis report on teachers in Northern Nigeria’s Basic Education sector. While the report will be available by next month, already its major conclusions can be found in our new Policy Briefs on Teachers. 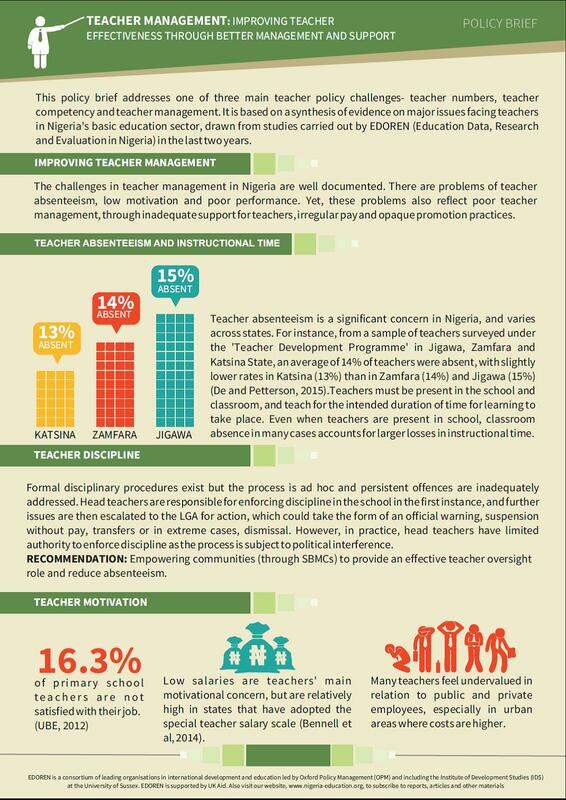 These Briefs provide an overview of three policy challenges facing teachers in Nigeria: Teacher Numbers, Teacher Competency and Teacher Management. For each, there are broad suggestions given which research has found to be important to tackle these major challenges. Some recommendations relate to additional investments (e.g. the number of additional teachers to be recruited in Northern Nigeria). While important, these may not be fiscally possible at the moment, given Nigeria’s current fiscal challenges related to lower oil prices. Other recommendations, however, can be implemented at relatively little cost. We note a few of those here below. 1. 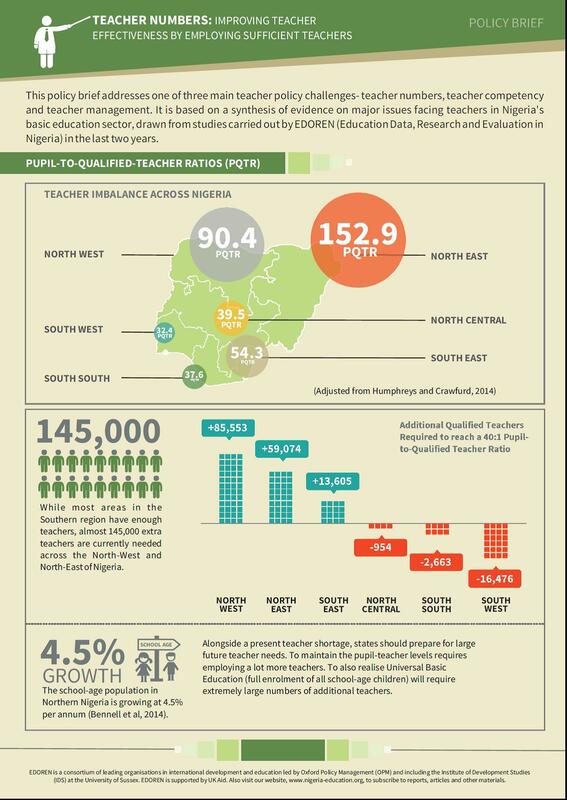 TEACHER NUMBERS: How can Nigeria recruit the best teachers, and ensure these are hired in adequate number even in the most rural schools? Enforce formal recruitment procedures through a written application and a teaching skills test to best capture new teachers’ motivation and skill. Ensure this is used by LGAs but monitored by the State. Improve deployment transparency (e.g. by publicly reporting teacher postings) to limit political patronage influence postings. 2. TEACHER COMPETENCE: How can Nigeria ensure teachers are well-trained, knowledgeable and have essential teaching skills? Improve quality of student teacher intake by enforcing merit-based selection. Adherence to graduation requirements can be enforced through external verification. Make in-service training more useful to other teachers, by ensuring trained teachers have the necessary course material and guides to provide better peer-to-peer in-service training. 3. TEACHER MANAGEMENT: How can Nigeria improve teachers’ commitment and attendance through better management? Empower communities, through School-Based Management Committees, to provide an effective teacher oversight role and reduce absenteeism. Ensure promotions are merit-based and linked to performance, and less based on academic qualification and years of experience. These broad challenges and recommendations are described in greater detail in our upcoming EDOREN report on teachers in Northern Nigeria’s Basic Education sector. This is partly based on new material, but also includes existing research on teachers For access to EDOREN’s published reports and subscribe for new content, see our partner website: www.nigeria-education.org. This also includes many other reports, articles and other materials. If you are interested in more research on Nigerian education, we will be launching a whole number of extra reports and policy briefs over the next few weeks. These will focus on a range of areas including on education data, private schools and more on teachers. 4th February 2016 in Blog. ← Is school classification worth all that fuss?